Tickets can be purchased at KW’s cash desk. The four meet in discussion, in the days leading up to the event. With the arrival of the audience, listening and distinct instrumentation will come together as a document of those previous discussions. All of this goes to demonstrate the continuous nature of documentation: adaptive, and prone to change and translation between formal, non-verbal registers. In a previous iteration at Cafe OTO, London a common theme was “hand-eye coordination”. Paul Abbott is an artist and musician based in London, working through questions and feelings connecting music, language and politics: using drums, performance, writing, and publishing. He is currently one of the Sound and Music “Embedded” resident artists at Cafe Oto and a co-editor of Cesura//Acceso journal. His current collaborations include XT (with Seymour Wright), lll人 (with Daichi Yoshikawa and Seymour Wright) and ULAPAARC (with Cara Tolmie). 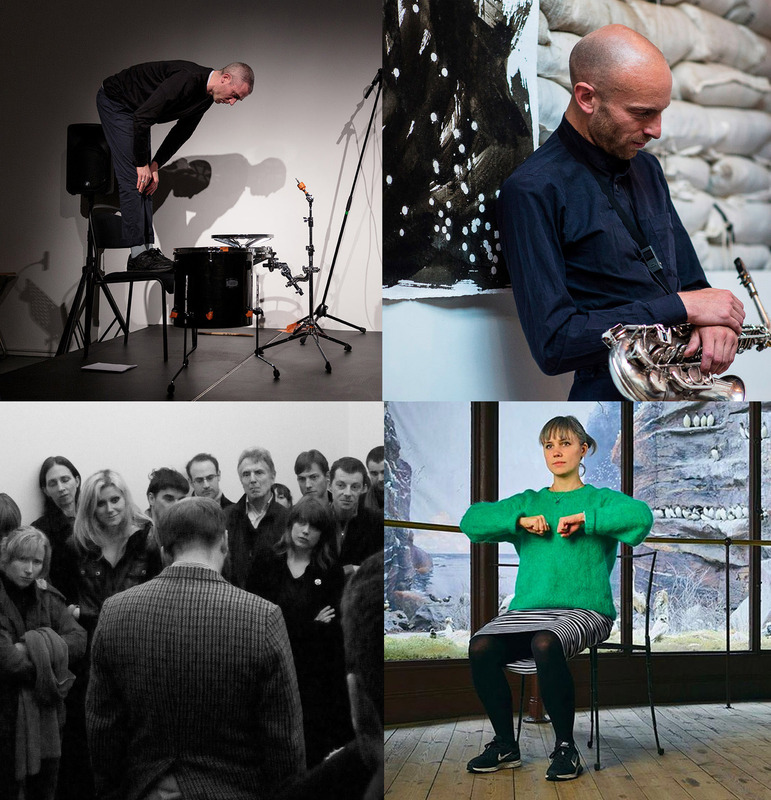 A series of solo performances in Cafe OTO’s project space are documented here. Recent releases include qno, Vagus, Pah’, and vjerhanxsk. Typographer Will Holder produces oral and printed publications with artists and musicians. He is preoccupied with conversation as model and tool for a shared set of publishing conditions—whereby the roles of commissioner, author, subject, editor, printer, and typographer are improvised and shared, as opposed to assigned and predetermined. Particular attention is placed on an oral production of value and meaning around cultural objects, and how live, extra-informational qualities might be analyzed, documented and scored. Holder is currently in residence at KW, and is editor of F.R.DAVID, a journal concerned with reading and writing in the arts (published with de Appel from 2007–16, and co-published with KW, since 2017). He co-curated TalkShow (with Richard Birkett) at the ICA, London, an exhibition and event-program concerning speech and accountability. Together with Alex Waterman, he edited and typeset Yes, But Is It Edible?, The music of Robert Ashley, for two or more voices (Vancouver: New Documents, 2014). Holder is a 2015 recipient of a Paul Hamlyn Foundation Award, and as such founded uh books, Glasgow, with Emmie McLuskey. Cara Tolmie works within the intersections of performance, music and moving image. Her works probe the site-specific conditions of performance-making by finding ways to vocalize and place her body that access the political and poetic capabilities of physical, written and musical languages. She collaborates regularly on projects with Paul Abbott, Kimberley O’Neill / France-Lise McGurn, and Patrick Staff and has contributed to many other collective endeavors both in performance-making, pedagogic and expanded research practice. She is also part of the editorial collective for Cesura//Acesso, a journal for music, poetics and experimental politics. Tolmie is a 2016 recipient of a Paul Hamlyn Foundation Award. Cara Tolmie and Paul Abbott will return to KW in the fall 2017, as guests in Prospectus: A year with Will Holder.